Don’t have time to cook in the mornings? Try these quick smoothie, omelette and overnight oats healthy recipes that will keep you energized for the day ahead. Mornings can be super hectic, and sometimes, preparing a lunch for kids and you according to the healthy breakfast recipes is the last thing we have time for. I get it — it’s easier to grab a breakfast bar or pastry at the coffee shop and have one less thing to worry about. The problem is that “quick fix” is just that — a “quick fix” that will only hold us over for an hour or two until we get hungry and grab something sugary at the office or that fourth cup of coffee. It is so important to eat a nourishing breakfast by healthy recipes that balances our blood sugar, satisfies our hunger hormones and sets up our day! We and our kids need quality protein, healthy fats and fibrous carbohydrates at breakfast to give us sustained energy throughout the morning. Having a nutritious breakfast does not have to be a whole ordeal and a messy kitchen first thing in the morning. All it takes is a little bit of preparation and creativity. Here are some healthy breakfast recipes ideas that you can prepare in advance to get going with your morning! Breakfast is the most important meal of the day and having a wholesome breakfast means you and your kid will have an excellent day. When you have healthy breakfast, you will feel better equipped to deal with the challenges thrown at you throughout the day. Researchers have recorded that children who do not have a good breakfast are not able to concentrate in school as well as children who have had a good wholesome breakfast. Yes, smoothies can be a mess — especially when you have to take out 8 ingredients from different places in the kitchen. It can be difficult to have time for all that work, clean up and then actually enjoy it! So here is a trick: Spend some time meal prepping your morning smoothies by healthy breakfast recipes for kids and you. It sounds funny, but it is genius! Take an hour on a Sunday and fill up five freezer-friendly Ziploc bags with all the smoothie ingredients, and pop them back in the freezer. The morning of, you can just toss the contents of the prepped bags into the blender with your favorite protein powder and the liquid of your choice (almond milk, coconut water, etc.) 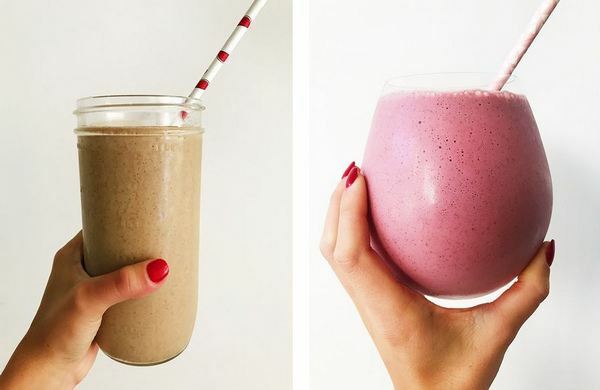 and voila — a nutrient-dense smoothie in seconds. All smoothie essentials freeze well, and this will save you a ton of time and hassle in the morning. You have found great healthy breakfast recipes ideas free. Some of my favorites include: a healthy tropical green smoothie at breakfast for kids, a blueberry bliss smoothie, a grown-up PB&J smoothie and a mocha morning smoothie. If you love your breakfasts savory, this one’s for you. Picture a healthy mini omelet — to go! These bad boys are great to prepare at the beginning of the week and keep in your fridge for the mornings. They heat up well, you can get creative with them and kids love ‘em too (healthy breakfast recipes bonus!). If you haven’t tried overnight oats, you’re missing out. With oats, almond milk and chia seeds as the base, you can throw in anything that your heart desires. Try hemp seeds and nut butter for protein, fresh fruit or even chocolate chips if you are feeling fancy. Spend a few minutes the night before adding all your favorite ingredients to your oats and enjoy in the morning — on the go! You can eat them cold or heat them up! Delish either way. I love this healthy recipe idea!